Stage-Tech dipped into its extensive inventory of Elation Professional lighting gear to deliver a lighting package for the Hard and Pink stages at this year’s Hard Summer Music Festival. 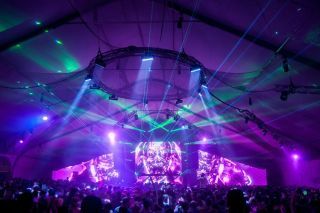 Stage-Tech has been involved with Hard Summer for the last eight years and this year handled design, lighting, video, and staging for both the Hard Stage and Pink Stage. With a venue change somewhat late in the scheduling – a move from the Auto Club Speedway in Fontana to the more scenic environs of the Glen Helen Amphitheater in San Bernardino – Stage-Tech had to be both flexible and resourceful, a challenge they met with the help of adaptable Elation lighting. On the Hard Stage, a large outdoor stage and the festival’s main performance space, Platinum FLX hybrid moving heads and Platinum Beam 5R Extreme beam lights were used to create a heavy beam feel from the center of the stage outwards. Guest used the multi-functional aspect of the 470W 3-in-1 FLX fixtures fully by shifting to spot mode for mid-air profile looks and to wash mode for occasional floods of colored light. The Hard Stage setup also included ACL 360 Matrix LED moving panels, as well as Lumina Strips. Mounted on the downstage truss the ACL 360 Matrix fixtures were the main source of downstage wash. The 5 x 5 matrix panels, with their continuous rotation and 4-degree beam from each lens, made other looks possible as well. Graphics and visuals on the Hard Stage were run across LED screens made up of Elation EPV375 HO™ transparent LED video panels, along with 7 mm LED panels. Design Wash 60 LED moving heads were also used on the Pink Stage for added color and effect while backdrop video screens made up of Elation 20 mm EVLED 1024T LED panels displayed eye-catching video and graphics.